Wait a sec ... didn't you win the Asgard Grand Prix? His toys are more sophisticated, his scripts are more polished and his budgets are larger. But even as he pushes 60, Ron Howard is still trying to prove his mettle with a car race movie. Long before he won a Best Director Oscar for A Beautiful Mind (and the one he should have snared for Apollo 13), the 23-year-old Happy Days star was cutting a deal with Roger Corman to direct his own movie for no salary. Howard’s critically maligned first feature was Grand Theft Auto, and 36 years and 20 films later, perhaps he’s trying to settle the score with his latest, Rush. Howard reteams with his Frost/Nixon scribe Peter Morgan to track the rivalry between British driver James Hunt (Chris Hemsworth) and Austrian champion Niki Lauda (Daniel Brühl), culminating in their epic back-and-forth battle during the 1976 Formula One season. The film has two main attractions. Meticulous period set design and grainy, ‘70s style cinematography plant the audience firmly the era, which Howard and cinematographer Anthony Dod Mantle (Slumdog Millionaire, Antichrist) supplement with exquisite race camerawork that spins the viewer outside, inside and around the cockpits. Digital effects occasionally lacquer a layer of artificiality on the action. Mostly, however, the blend of reality and F/X is seamless. Morgan mostly avoids the loose treatment of facts seen in his previous sports-themed screenplay, The Damned United. Still, Rush implies that the 1976 season was the first time Hunt and Lauda raced each other on the Formula One circuit, which in fact it was their fourth. The most daring maneuver in Rush isn’t the high octane racing, but instead the way Howard flips the easy classifications of hero and villain. After the cocky Lauda nearly dies in a fiery crash at the German Grand Prix at the Nürburgring—a race Lauda wanted to boycott because of unsafe conditions but was outvoted by his fellow drivers, led by Hunt—his improbable return to the cockpit a mere six weeks later elevates the Austrian to a fan and audience favorite. 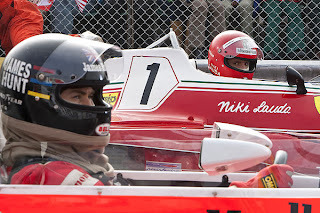 Howard spares few details in detailing Lauda’s grueling recovery; a scene in which he painfully and stubbornly attempts to slide a race helmet over his burned skin is the most daring and uplifting moment of the film. Howard’s execution isn’t perfect. Some irregular narration adds little beyond distraction, and as the drivers’ significant others, Olivia Wilde and Alexandra Maria Lara are given little purpose beyond being pensive onlookers. But the biggest misstep might be not releasing this adrenaline rush during the summer, when it could have been a surprising bit of high-minded counter-programming, instead of slotting it in early fall, in what the filmmakers imagine must be the pole position for the awards season.